Cut chicken breasts (or thighs) into bite-sized pieces. Cut green onion (or green pepper) into one-inch pieces. Skewer the chicken and onion/green pepper in alternating order. To make basting sauce, mix sugar, sake/cooking wine, mirin/ honey, and soy sauce in a pan and bring to a boil. Stir occasionally, then remove from heat. 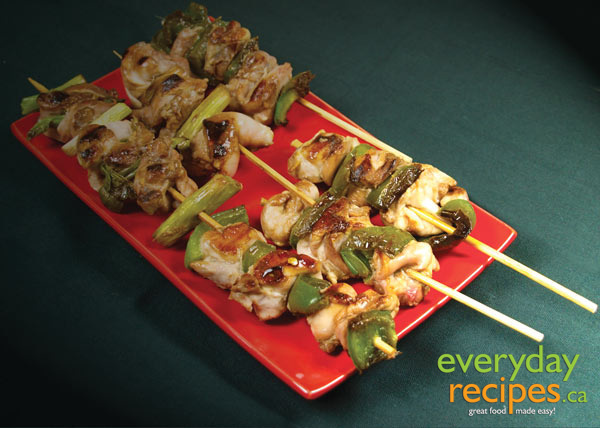 Grill the skewered chicken over hot coals, on a portable electric grill or in an oven. Baste skewers often with sauce until the chicken is cooked.